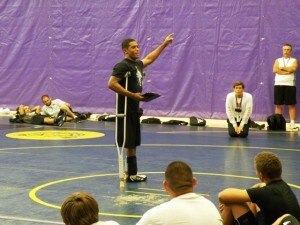 Anthony Robles, an All-American wrestler at Arizona State University, speaks at GCU's camp. With a captive audience of young wrestlers spread out before him, NCAA champion Anthony Robles didn’t want to talk about his victories. Instead, he focused on a 90-pound, 14-year-old boy who lost eight of 13 matches — most of them by pin — as a freshman at Mesa High School. Robles kept showing up for work. Mentored by an upperclassman, Chris Freije, he stuck with it. And now the inspirational story of how the kid born with one leg won an NCAA title this year at 125 pounds for Arizona State University is known to the entire sports world and beyond. In two weeks, he’ll be in Hollywood for the ESPY Awards, where he will receive the Jimmy V Award for Perseverance on the night of July 13. “He’s an ambassador for our sport,” said LaHaye, who has known Robles for years and managed to snag him to speak and instruct at this week’s camp. Not surprisingly, that took some finessing. Robles said he has been in the state for only two days in the past month. Book, film and shoe deals and speaking engagements are swirling about him, although he mentioned none of the above to the campers. Robles recalled the quantum leap he made between his freshman and sophomore years in high school — the result of sweat and sheer determination. The boy with the 5-8 record improved to sixth in the state and then went unbeaten as a junior and senior, earning a scholarship to ASU and ultimately becoming a three-time All-American. 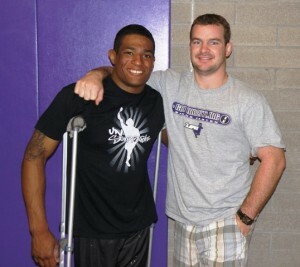 Robles and GCU's head wrestling coach, R.C. LaHaye, are longtime friends. Freije, who is helping with the camp and now coaching at Mesa State College in Colorado, could see it coming. Freije counts Robles’ NCAA championship, which he witnessed in March in Philadelphia, as one of his favorite wrestling memories. Robles said that immediately after his victory over defending champion Matt McDonough of the University of Iowa, his iPhone blew up with 100 text messages. He still hasn’t had time to return almost 1,000 messages on Facebook, he said. Robles advised the campers to focus on what they’re able to control. “Maybe you’re from a family where your parents are divorced,” he said, recalling the time when his father left his mother to raise five children by herself. “Worry about the things you have power over. A truly inspirational post, and one which makes my problems seem so trivial, what a character! It shows that with determination, one can overcome anything. I am in awe of this young man. A great post, thank you for sharing this story.